I was at a fork in the road (metaphorically), and I needed to figure out whether I’m going to frame the wall stud extensions with aluminum or wood. They each have their advantages and disadvantages, and if I’m going to go aluminum, that means I need to buy a lot of tools and equipment and learn multiple welding techniques. Aluminum is light-weight and strong. It doesn’t rust, won’t warp, won’t rot, and it’s what the frame and walls of my trailer is built out of. In order to work with it though, one must be able to weld aluminum, which is not an easy task. To weld aluminum, one must first learn how to weld steel, (as a beginning step), then buy additional equipment and learn how to weld aluminum. When welding aluminum, the thickness of the material makes a difference in which welders will handle it and which will not. Wood is a familiar material which is readily available, relatively cheap, and easy to work with. It does have a lot of failings though, it can warp, rot, and otherwise fall apart with enough stresses and time. To figure out which material I was going to go with, empirical data was required. In the aforementioned aluminum attributes, the thickness of the material makes a difference in which equipment is needed. Since I didn’t have any experience in working with aluminum, I needed to obtain some samples and put them through tests. Locally, the only alumium square tubing (the shape of choice) that was available is in 1/16″ inch thickness in one-inch square tubes that are 4 feet in length. This material is a reasonable choice of thickness as it is relatively common when ordering from large online wholesellers and can be obtained in 8 foot or whatever lengths are necessary. So I picked up two different pieces, one from Home Depot, another from Tractor Supply. They were the same product, but had different weights, they must have been different grades of aluminum, not that their labels would actually divulge that information. My test was simple: if I stand in the middle of the tubing, does it bend? If so, how much? 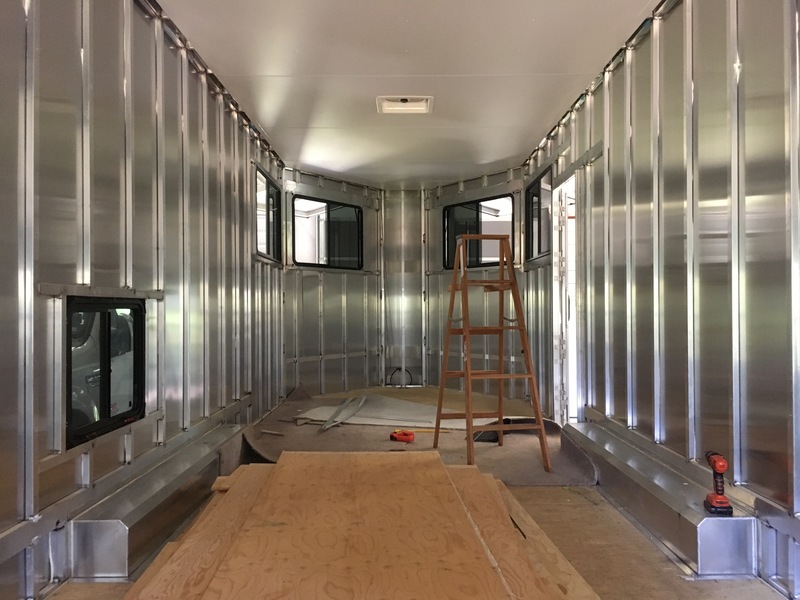 In my trailer, if I were to use square tubing to handle the framing of the loft and “basement”, there would be 8 foot sections that must withstand at minimum 200+ pounds of weight, without any supports other than at the edges. My test with these 4′ sections was very simple: put them on wood blocks so they’re off the ground, and stand on the middle of each of them. Measure the displacement or bend of the tube. If it’s basically unnoticable, then we’re good to go. If they have a slight bend, more testing with thicker materials will be needed. If there’s a significant bend, then much heavier (thicker) materials would be needed. And the results… Significant bending over a 4′ section. That means over an 8′ section there would be even more bending, which means I would need a much thicker material. Aluminum is not cheap. An 8′ square tube with 1″ walls and 1/16″ thickness is around $11. 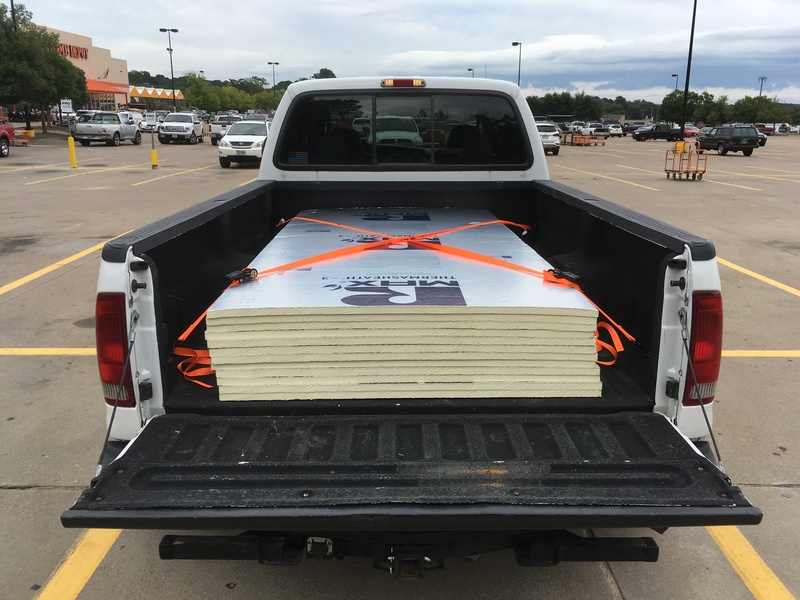 A standard 2×4 from Home Depot is somewhere around $4. Given the test, I expect I would have to go up 2″ walls with 3/16″ thickness, and that’s $62 each. Or, I could switch over to some rectangular tubing, say 1″x3″ @ 1/8″ thickness, but even those are $43 per 8′ section. Regardless, it’s very expensive. Then there’s the tools. To weld aluminum, especially of this thickness, a 220v welder is required ($699 minimum), plus a spool gun ($300), plus the standard welding safety equipment (let’s budget $200). Then when cutting metal tubing, a standard miter saw won’t work, one needs a special saw ($500). Once I’m done adding up all the tools plus material costs (plus time to save up the money & learn how to operate everything), it was going to be several thousand dollars more expensive and take at least 3 months in additional time, if not more. So, I’m going with wood. It’ll be slightly heavier, but not by all that much. So long as I keep the inside relatively climate controlled (which I’m planning on doing) and keep the leaks out (I’ll have a set schedule for roof maintenance), it should work out fine. Now that the decision to use wood has been made, the next step in the project is to remove the ceiling and add 2 additional inches of insulation. When I ordered the unit from the factory, I had one inch installed, but that just won’t be enough. The image above is what the ceiling looks like with the 1″ of loose insulation. I’m in the middle of installing the additional 2 inches now, plus I’ll be filling in the gaps on both sides. 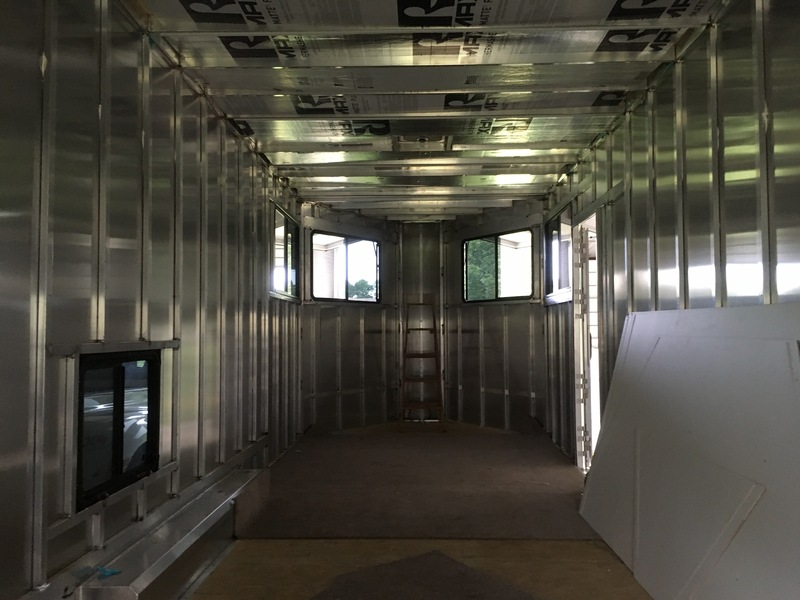 The trailer is 8’6″ wide, the sheets are only 8′, so even after framing is taking into consideration, there’s still gaps. I’ve been adding the extra insulation for about a day and a half now, and it’s tedious. Once the process is figured out, I’m accustomed to letting a computer take over and do the rest. That just doesn’t work for this. Next Next post: Let there be light!